Ok, I just had to merge Soren's Photo DR into this thread! It was just too damn funny for it to be in the random thread especially with Dan & Joey and the German chicks! If you haven't seen it, scroll up and take a look! It's great!!! that was a great day at Phantasialand! I really liked the Michael Jackson ride and Winjas! Winjas was amazing, with the different tracks and the effects! My favorite ride there, too! And again, thanks for the last 3 days! great tr but the name of the intamin's tower is "Mystery Castle"
We were told over and over that many people who were meeting up with us thought we would never be able to make it to this park and I'm really happy that we did! While we didn't get to ride the rapids ride at Phantasialand (line was over an hour and we didn't want to get soaked right before leaving the park) we feel like we really got to do everything we wanted to at Phantasialand, so we didn't mind leaving early to get to Klotten. The park was just about an hour away, and it's a small park, so even though we only had about 3 hours there, that was plenty of time to do everything multiple times. 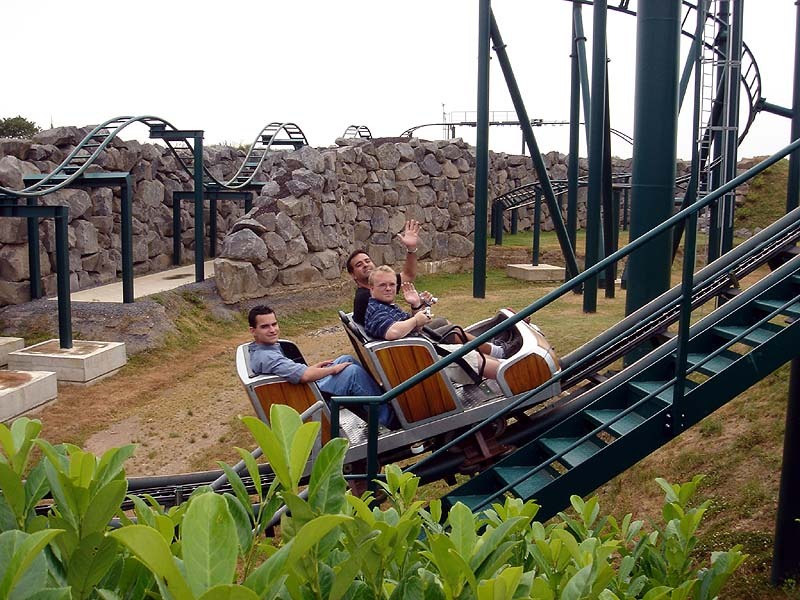 The coaster here is a "Gerstlauer Bobsled" and after we saw video of this crazy thing we just HAD to get out and ride it. We are really glad we did because this was one MESSED up great ride!!! It uses similar cars as those found on the Gerstlauer wooden trains, but these didn't hurt because the ride is very smooth. 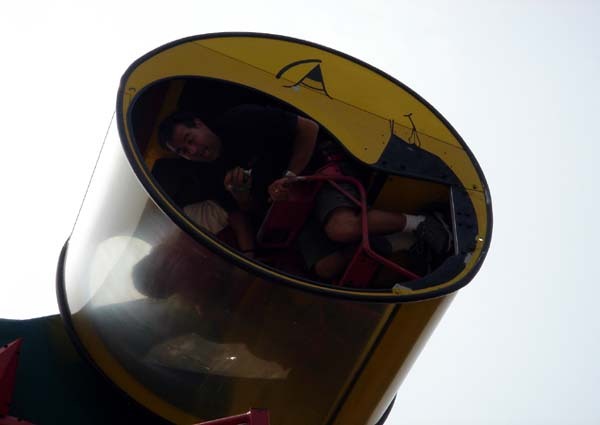 It has this crazy helix of death that you just have to see photos of to believe. 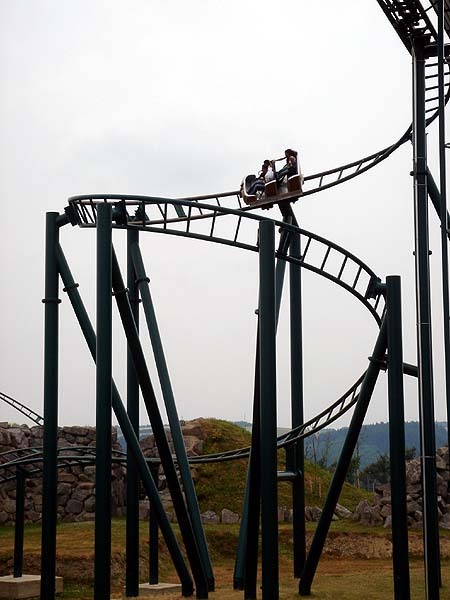 And then it has like 5 bunny hills in a row towards the end that each one of them produce 'Balder-like' airtime!!! :o This ride was GREAT! Upon looking at it, it looks like an overgrown Wild Mouse, but what it reminds me of are the Wild Mice I would create in RCT! Forget the typical layout, give me a bunch of crazy drops, airtime hills, tunnels, etc. That's what this ride is. Quite honestly, it was better than anything we rode at Phantasialand, so I would have been really bummed if we had missed this ride. While this wasn't quite as bizarre, it was up there! 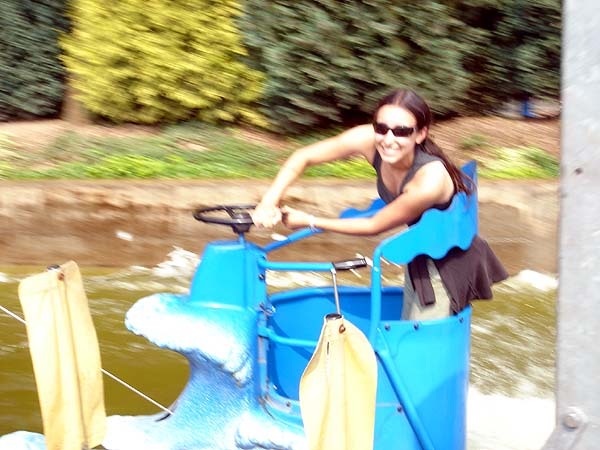 Picture this...it's a self-operated ride where you get into a single-man tiny boat on a track. You push the button and it pulls you up the spike "Boomerang Style" and when you get to the top it releases your boat. 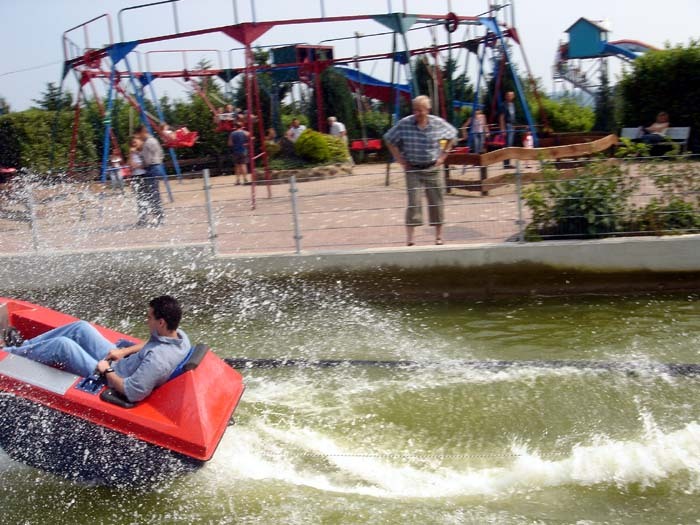 You fly down the track REALLY fast, hit a 'jump' in the track, fly about 10 feet into the air and *CRASH* into the water producing a HUGE splash! I AM NOT MAKING THIS UP!!!!! Download the video clip, and you'll see what I mean! It was insane!!!! Anyway, we did a number of other things at the park, which you'll see the photos of below...but download the jumping boat thingy! While the coaster was amazing, that was really the highlight of this strange place!!! 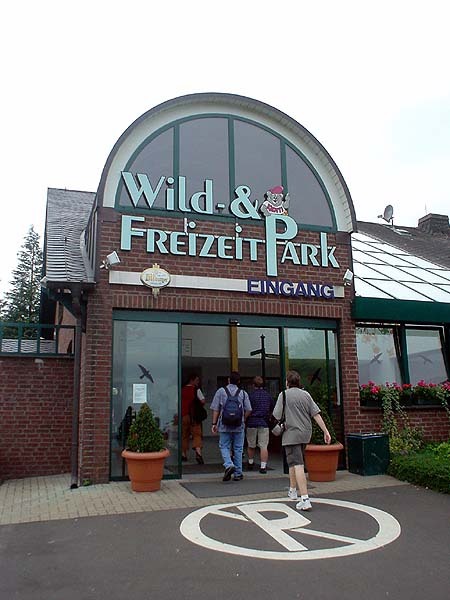 They had little RatTums' or "Sea Pigs" as they call these in Germany, so this alraedy is an "Elissa Friendly Park!" 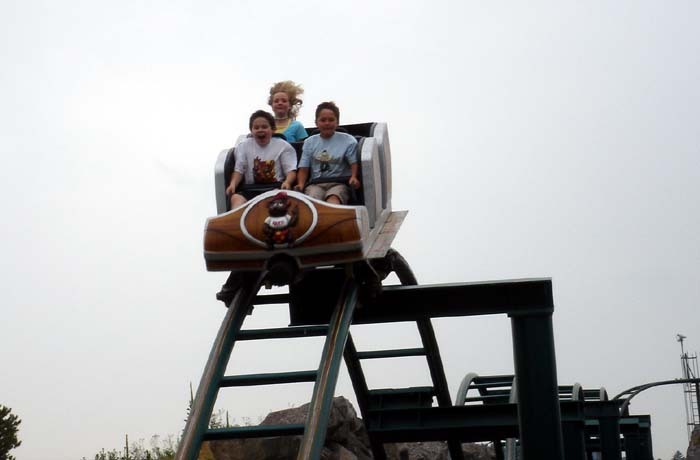 The helix of death on this wacky Gerstlauer coaster. 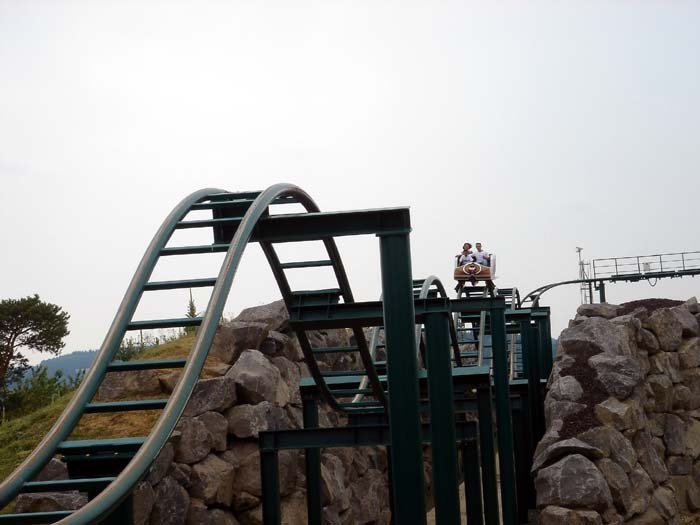 There is "Balder-like" airtime on every hill! 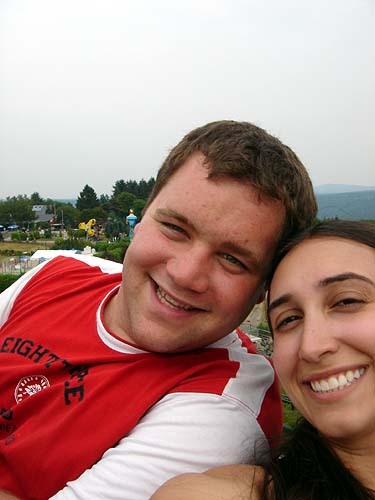 Awww...doesn't Peis and Elissa look cute? Here we go, getting ready for massive amounts of airtime! 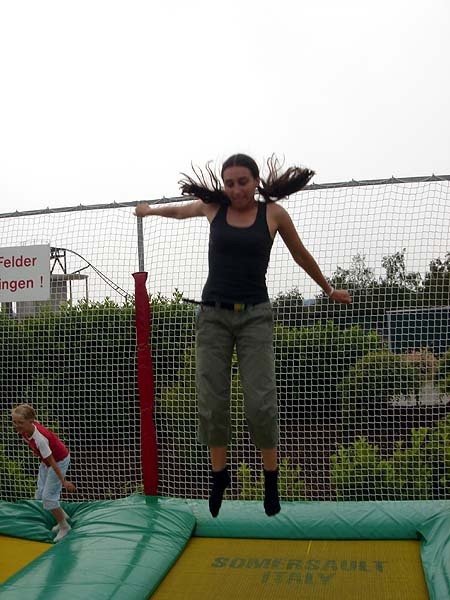 Elissa is loving the trampolines all over Europe! 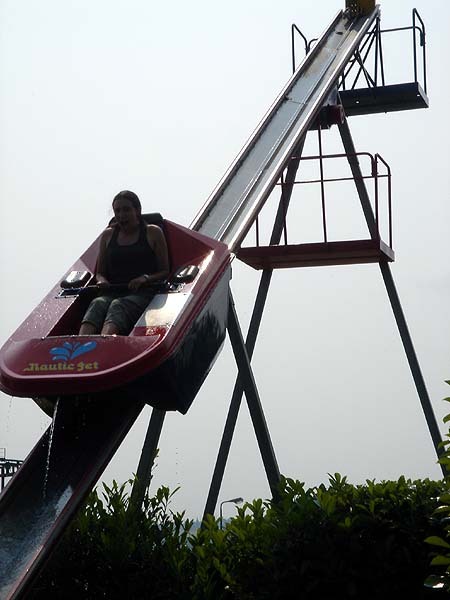 The self-operated upside down flat ride. It was kind of like a rock-o-plane, except that you just pushed a button on the panel and it rotated upside down! 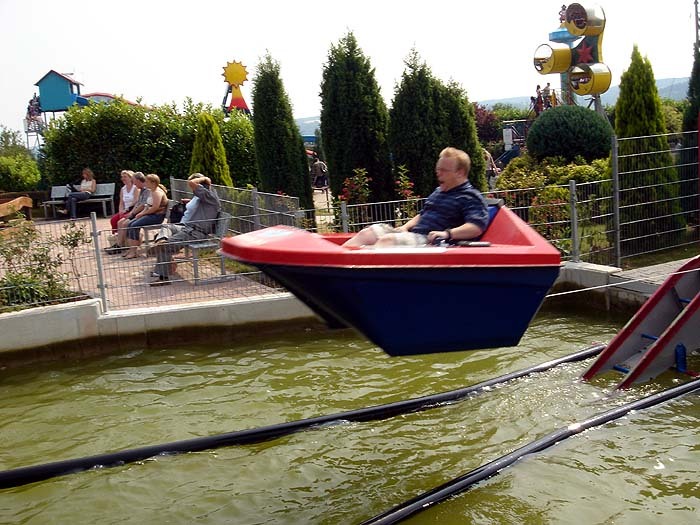 They have one of those "AquaZone" rides that you see at Legoland. And now...the self-operated 'jumping boat thingy'. Here are the instructions. I love how the rider has to "pull the cord" to start the ride! First the boat gets pulled up "Boomerang Style"
Then the boat comes screaming down the drop and hits the "jump" and you go flying in the air! Soooo... It seems you liked Klotten! I'm glad to read that! I am glad you have found Bench "Garden seat": The Ride. I was stunned when I saw the garden seat come out of the dark and around the corner. It was like WTF !!!. I hope you holiday is as good as mine was in the US last week. Now back in the UK. Its good to hear you have so much fun. I was considering coming to Phantasialand too today, but at the moment I just can`t afford any Parkvisits as sad as it sounds. 1. 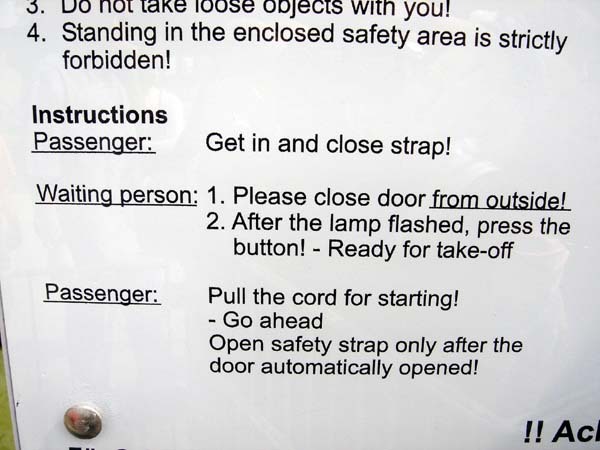 The ride programm: There are actually three different programms. 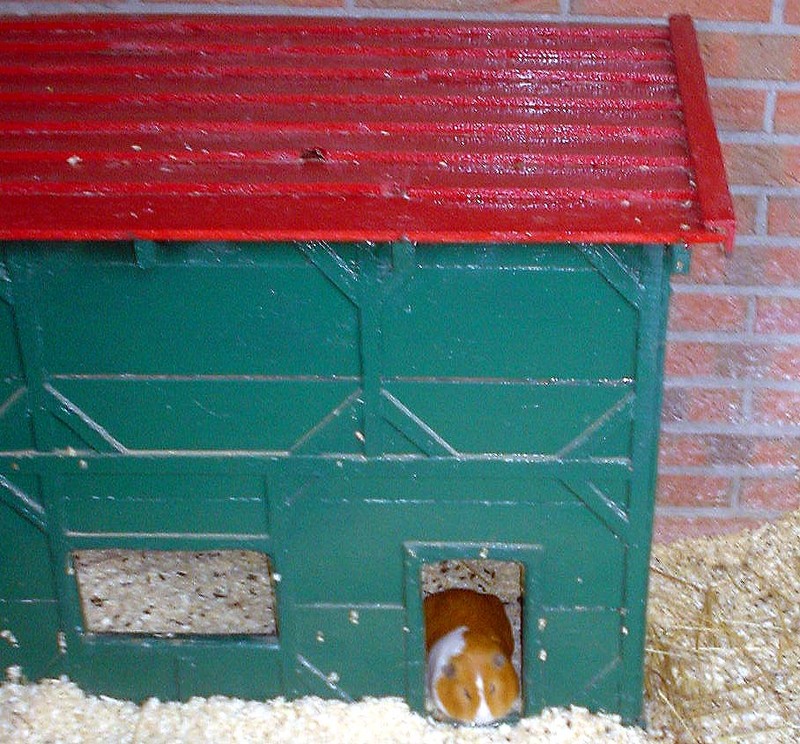 On busy days they use the fast up-down programm, which isn`t as good as the other two. 2. The "monsters": actually there is more theming to the ride than just the castle and the cue rooms. There used to be some frighteners that go along with the story and scare the people waiting in cue. So its part haunted walkthrough and part freefall experience. I haven`t been to Phantasia since 2 years, so I don`t know if they still use the haunts at all. 1st post! lol. Anyhow, in day 10 you guys did that Survival Course at Toverland, and you said it would never be allowed in America? Well im here to prove you wrong. About 2 years back when I was still in High School, ROTC used to take a 1 week "Boot Camp" up in Lost Valley, Ca. Its about a 2 hour drive in bum frikken no where outside of Corona. Within the camp there is a course just like that but with a zip-line at the end going down a like 80 foot hill. Of course we had to do it Military style i.e cant use harness for support and push ups. It was really fun. Have a good time out there. Now, I am really jealous. WOW! when I first saw the boat jump thing pics I thought it was an edited picture, a joke!